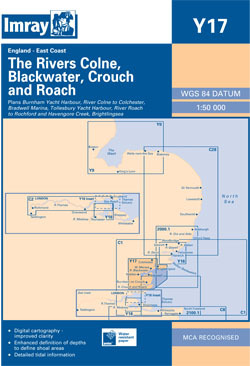 The whole of the Rivers Colne, Crouch, Blackwater and Roach. Scale: 1 : 49.000. Larger scale plans of Brightlingsea harbour, Tollesbury yacht Harbour, Bradwell Quay and Burnham Yacht Harbour. On this 2015 edition the chart has been updated throughout with the latest known survey data.